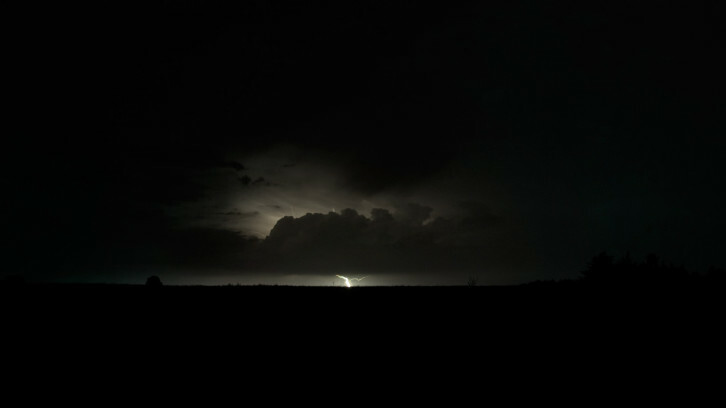 Yesterday there was an amazing thunderstorm with a rather high frequency of lightning. So before going to bed, I decided to go out for half an hour and try to catch some. With a long exposure of about 15 seconds, I managed to get a nice flash right in the center. I cropped this to 16:9 format to discard some of the empty blackness and changed the white balance, because on auto WB the picture had too much orange – which is not at all how it looked at the time. After fixing that and a quick de-noising, this is it.